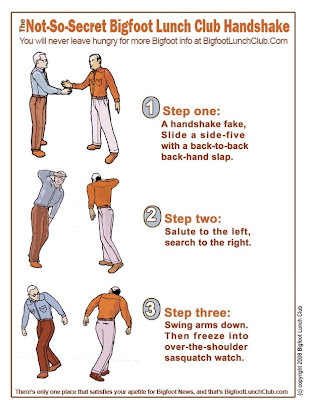 Click picture to see larger version and learn the handshake! Want to see how it is done? Watch Below!! Great idea we will produce one soon! But let me do my best to explain: A handshake fake (reach out like your going to shake their had). Slide a side-five with a back-to-back-hand-slap (slap your friends hand palm-to-palm, then bring your hand back so your slap the back of your hands, and then a final slap palm-to-palm again.) You should hear three claps if you do this right. Why do you suppose normal people don't take you people seriously? I would argue that we are normal people too. I would also like to add, that persuading people to take us seriously is not something I see any value in. Topics should never be pursued because someone else has said it is important and interesting. Topics should be pursued because they have captured your own imagination and interest. If Sasquatch has not captured your imagination or interest, than I hope another subject has. Once you pursue that subject, I hope you too, will not worry if you are taken seriously. Guy Edwards, I completely disagree. I would argue there is no such thing as "normal," except as a setting on my washer or dryer. Curiosity is an attribute common to most animals. Homo sapiens is certainly not an exception. Some chose to think all "real" researchers are "serious." Even Albert Einstein seems to have had a funny side. I consider this handshake ritual to be a humorous artifact of human behavior. Ultimately, it is a test as to whether you will be too strident and not willing to let go of your personal ego. I cannot take that too seriously either. The Skookum could not be to be a social animal, supposing that they exist. They must be of the "Leave No Trace" religion. Their coat is the equivalent of our ghillie suit. They must use their ears far more than their mouth. Homo sapiens seems not to be so inclined. I agree with you JLS. I was responding to the context in which anonymous uses "normal". The washer/dryer and Einstein are a clear examples for your argument. And thank you for appreciating the handshake in the spirit I intended. Your handshake has the actor looking past his/her left shoulder with left leg forward. In the famous frame 352, Bob Heironimus looks past his right shoulder, right leg forward. Ha! smooth..I caught the reference and want an opportunity to argue for Sasquatch...willing? People who know how to spell. Put your right hand in, pull your right hand out, put your right hand up and look all about, do the Squatchy Watchy as you turn yourself around, That's what it's all about.. Duh! I really never get tired of seeing this...always a good laugh!! Next time I see you I want to do this hand shake. Thanks for keeping it fun!!! I don't understand why there is not a secret footshake. Fear of spreading athlete's foot. How many box tops to join . . ? Cheers! i think the handshake idea is a great one, we need some unity in this bigfoot community and what better way then a secret handshake !!!! Great story. Very interesting and believable and being from Denver and also being very familiar with the area, I was completely engulfed in the story. WISH YOU HAD SOME VEIDEO OR PIC'S THOUGH!